Magic: The Gathering has a big date coming up, a combination of silver anniversary and homecoming as we head into Dominaria. Anyone who's gone on a big date knows you want to look your best, and we've been working for the past year or so to freshen up the cards themselves to be ready for this momentous occasion. There have been a number of big changes in the way cards look and read over the years, from the Classic Sixth Edition rules overhaul in 1999 to the latest frame update with Magic 2015 (in 2014, obviously). The changes we put together for Dominaria are the latest in our constant attempt to keep the game modern, fresh, and accessible, and although this batch is not of the same scale as some of the past changes, they do improve the game experience significantly and solve a number of problems we've been wrestling with for years. In a strange quirk of product scheduling, we were able to squeeze the changes into Duel Decks: Elves vs. Inventors, which comes out a few weeks in advance of Dominaria, so you get the sneak peek here using cards from that product! You should take a look through the full Duel Decks: Elves vs. Inventors Card Image Gallery to see all the templating, art, and rules changes that have been implemented in that set. I'll go over them in three sections: cosmetic updates that don't affect gameplay, templating changes that update how we word certain cards, and a rules change of some import. For now, let's see what you can look forward to through the lens of Elves and Inventors! One of the quirky things about Magic cards is that reminder text and flavor text both use the exact same font, from the inception of modern reminder text way back in 1996's Mirage all the way through today. While not using additional fonts or treatments has kept cards very clean-looking, it has often been hard to tell where rules end and flavor begins. Newer players sometimes bleed rules and flavor together, not knowing where one ends and the other begins, and veterans sometimes miss second or third abilities sandwiched between italicized sentences. This has bugged us for a while, and we looked at a bunch of alternatives, including graying out flavor text, using a different typeface for one or the other, or putting a shaded box around one or the other to separate them at a glance. Ultimately, we decided to go back to our old bag of tricks, borrowing something from the original Portal (the 1997 set, not the upcoming phone app)—a simple bar, centered in the text box between rules and flavor. As we roll out more details and sneak-peaks of Dominaria, you'll see that the set focuses heavily on the many legendary characters of the world—heroes past and present—and gameplay was designed to highlight them in cool new ways. Heck, the tagline is "Gather Legends"! With how relevant they were to playing the format, we wanted a clear visual indicator to make it clear at a glance which cards were legendary and which weren't. We landed on a crown-like embellishment around the title bar of the card; it extends into the card's black border in a really striking and regal way. We were so happy with it that we've decided to use it outside of the block on all legendary cards (other than planeswalkers—they look different enough already) going forward. 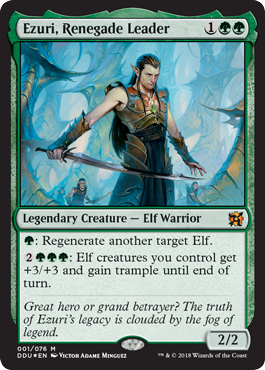 Here it is on elven powerhouse Ezuri, Renegade Leader. Lands have had wording that refers to "your mana pool" since the game's inception, but the mana pool is not a big part of playing the game (most people just tap lands to pay for things without ever using an intermediate holding place), and the term is a constant source of confusion for players learning the game. To get the mostly unnecessary words off of cards, we've shortened the template of mana-producing cards to "Add [mana]" instead of "Add [mana] to your mana pool." 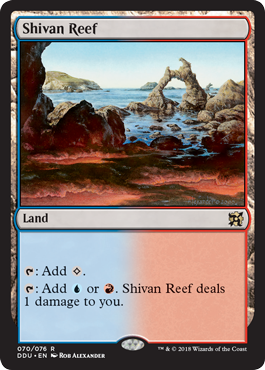 Here is the much-streamlined version of Shivan Reef. In its desire to always be correct and consistent, Magic's rules templating has always opted for the Chicago Manual of Style's method of referring to a person of unknown gender: "he or she." Or "him or her" or "his or her." There are a lot of reasons not to like those phrases. For me, the problems are that they take up a lot of words and that no one actually talks that way. People use the singular "they" all the time conversationally, and as language changes, the rules of proper usage have relaxed enough that we're comfortable switching to it now. Hooray! What's not hooray-worthy, unfortunately, is that there aren't any cards in Duel Decks: Elves vs. Inventors that use the new template. But as an example, check out the current and future text for Duress. And if this change, in addition to saving words, makes our card text more inclusive for people that don't identify as either a "he" or a "she," that's super awesome as well. 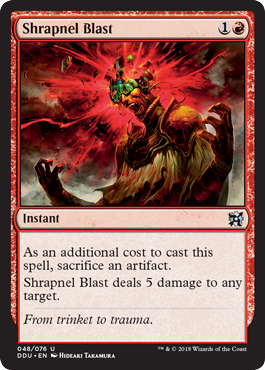 Examples of other cards that will get text updates with this change are Force of Will, Gravecrawler, and Shrapnel Blast, the latter of which you'll see momentarily! We're only making one rules change this time around, but it's a pretty big one. Those of you who follow me on twitter or are playing in the Magic: The Gathering Arena Closed Beta already have some insight into the change—one that's been a long time coming. We're removing the rule that lets player redirect non-combat damage to opposing planeswalkers, and instead writing on cards (or in Oracle, for older cards) that a spell or ability can damage a planeswalker. Yes, this is a pretty big change, with about 700 cards slated to receive errata and many more changing functionally even though their text will remain the same. But Magic will make more sense now. Back when we were designing the initial batch of planeswalkers for Lorwyn in 2007, we wanted the rules to work this way; damage spells should be able to hit planeswalkers directly. But not knowing if the new card type would be sticking around, we didn't pull the trigger on the massive errata back then, instead coming up with a rule that let players mostly mimic that functionality. And while "Lightning Bolt your Jace" became an acceptable shortcut, there were always several unwanted unintuitive interactions. For example, Leyline of Sanctity made Bolting Jace impossible, as the Bolt needed to target the hexproof opponent and then be redirected to Jace. Similarly, Turn Aside could not be used to counter a burn spell intended to kill a planeswalker. An Arc Lightning could not be divided between a planeswalker and its controller. Or a Bonfire of the Damned would kill all of a player's creatures, but only damage one of their planeswalkers, and then the player would no longer be taking damage themselves. Those interactions were really confusing, even for longtime players, and continued to highlight the need for the rules to match players' intuition: damage spell and effects should just be able to target planeswalkers. So we're letting them. The words "any target" specifically mean "target creature, player, or planeswalker." So no, you can't Shrapnel Blast my Island. Or my graveyard. Not that you were going to try, but I guarantee you someone would ask. Things that read "target creature or player" will be changed to "any target." E.g., Lightning Bolt, Walking Ballista, Shrapnel Blast. Things that read "target player" will be changed to "target player or planeswalker." E.g., Lava Spike, Boros Charm, Kessig Malcontents. However, if the amount of damage is calculated by using information about that player or objects they control, the text will remain unchanged and can now damage only the player. For example, Sudden Impact deals damage to a player equal to the number of cards in their hand, and since that text can't apply to planeswalkers (they have no hands—hands of cards, that is), the card will not be able to damage planeswalkers in the future. Things that read "target opponent" will be changed to "target opponent or planeswalker" with the same exception listed above. These spells and abilities will now be able to target a planeswalker you control, which is a slight functional change that we don't think matters enough to be worth more words. 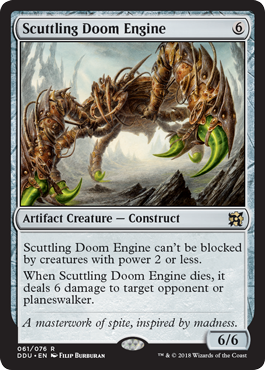 Examples of cards that will change include Scuttling Doom Engine (pictured below), Burning Sun's Avatar, and Jeskai Charm. An example of a card that is not changing (and we're going deep here) is Jovial Evil. Yes, that's a card. Things that deal damage but don't call for a target will not receive errata, with one exception in Vial Smasher the Fierce. That means cards like Earthquake, Price of Progress, and the activated ability of Hazoret the Fervent can no longer damage planeswalkers. Additionally, we will be issuing similar errata on cards that can prevent damage to make sure the interactions between those cards and planeswalkers is clear. Some things change, others look like they do but don't. If you are interested in more of the details, look for Eli Shiffrin's Rules Update article that will come out in advance of Dominaria. He'll go over everything in more depth and provide lists of all the cards that will be changing. With these new improvements in place, Magic is ready for its next 25 years! 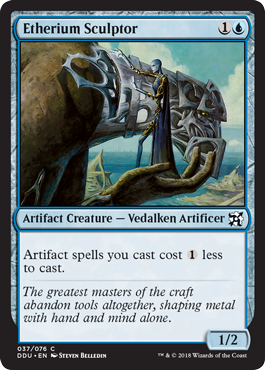 Legends look cooler, templates are simpler, planeswalkers work the way they always should have, and Dominaria is right around the corner. What a great time to be playing Magic! And if you want to get your hands on cards with the new treatments early, grab a copy of Duel Decks: Elves vs. Inventors at your local game store! A huge thanks to Ethan Fleischer and Dave Humpherys for coming up with many of these ideas; the talented editors, graphic designers, and rules manager of R&D's Delta team for tirelessly perfecting everything; and to our digital partners on MTG Arena and Magic Online for making these improvements happen on every platform the game has to offer.